The brake system of this motorcycle is filled with a glycol-based brake fluid. Do not use or mix different types of fluid such as silicone-based and petroleum-based fluids. Do not use any brake fluid taken from old, used or unsealed containers. Never reuse brake fluid left over from the last servicing or stored for a long period of time. Brake fluid, if it leaks, will interfere with safe running and immediately discolor painted surfaces. 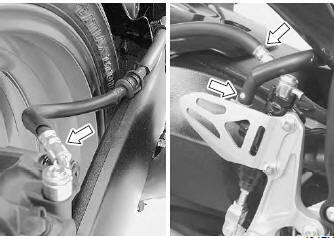 Check the brake hoses and hose joints for cracks and oil leakage before riding. Keep the motorcycle upright and place the handlebars straight. 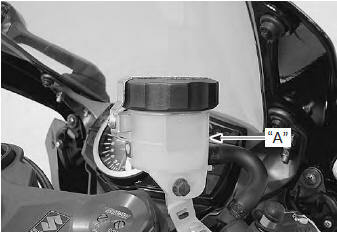 Check the brake fluid level by observing the lower limit line “a” on the front and rear brake fluid reservoirs. When the brake fluid level is below the lower limit line “a”, replenish with brake fluid that meets the following specification. 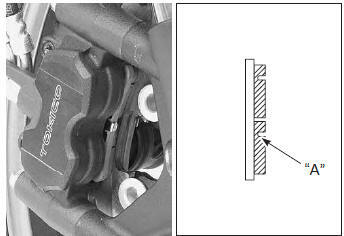 The extent of brake pad wear can be checked by observing the grooved limit line “a” on the pads. When the wear exceeds the grooved limit line, replace the pads with new ones. Refer to “front brake pad replacement” in section 4b and “rear brake pad replacement” in section 4c . replace the brake pads as a set, otherwise braking performance will be adversely affected. 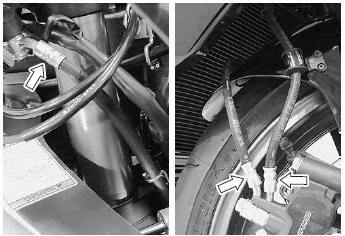 Inspect the brake hoses and hose joints for crack, damage or brake oil leakage. If any defects are found, replace the brake hose with a new one. Refer to “front brake hose removal and installation” in section 4a and “rear brake hose removal and installation” in section 4a . 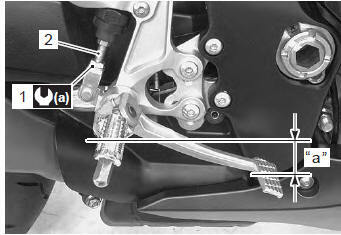 Inspect the brake pedal height “a” between the pedal top face and footrest. Adjust the brake pedal height if necessary. 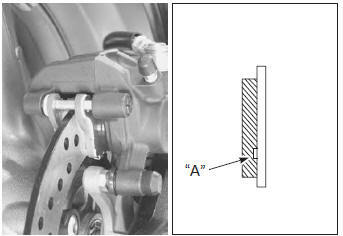 Turn the push rod (2) until the brake pedal becomes 65 – 75 mm (2.6 – 3.0 In) “a” below the top of the footrest. Tighten the lock-nut (1) securely. Refer to “front brake hose removal and installation” in section 4a and “rear brake hose removal and installation” in section 4a . Refer to “brake fluid replacement” in section 4a . 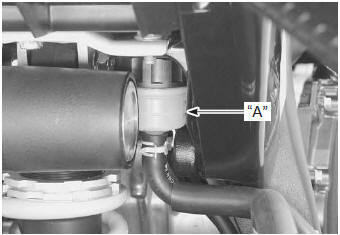 Refer to “rear brake light switch inspection and adjustment” in section 4a .